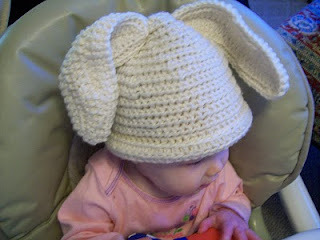 Here is an updated picture of my little Easter bunny :) Used the ear pattern but made it with a toddler beanie. You can use any highly rated beanie pattern on Ravelry for this pattern! It was rather hard to take this picture as I was laughing so hard my whole body was shaking! Is this not the cutest little hat ever?! This hat is not suitable for sleep and should not be used as a toy. People have been letting me know that the math on this hat doesn't add up. I don't have the time to fix it now, but hopefully soon. I haven't had a complaint on the ears and I just remade them so they are fine and dandy to use. I suggest browsing Pinterest or Ravelry for a great basic beanie pattern that you can put these ears on. 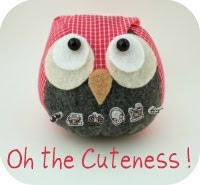 Don't forget to check out my other free crochet patterns HERE. Yarn: Worsted weight cream color and optional pink for the inside of the ears. Size: 6-12 mos. This is really up to the size of your baby's head. R2- Ch 2, hdc in same space, *1 hdc in next ch sp, 2 hdc in next ch space* repeat around, join to top of ch 2. R3- Ch 2, hdc in same space, (1 hdc in next 2 ch sp, 2 hdc in next space) repeat from ( to ) around, join to top of ch 2. R4- Ch 2, hdc in same space, (1 hdc in next 3 ch sp, 2 hdc in next space) repeat from ( to ) around, join to top of ch 2. R5- Ch 2, hdc in same space, (1 hdc in next 4 ch sp, 2 hdc in next space) repeat from ( to ) around, join to top of ch 2. R6- Ch 2, hdc in same space, (1 hdc in next 5 ch sp, 2 hdc in next space) repeat from ( to ) around, join to top of ch 2. R7- Ch 2, hdc in same space, (1 hdc in next 6 ch sp, 2 hdc in next space) repeat from ( to ) around, join to top of ch 2. R8-17 Ch 2, hdc around, join to top of ch 2. R3- (I am not sure how clear this will be so the picture below is showing you how to do this) Ch 1 and connect to other side of ch 25 with a sc. Repeat from ( to ) from R2. Inside of ear: Repeat rows 1-3. FO and leave a tail as it will also be tuck in in the next step. This will be the inside of the ear. Lay it inside the back of the ear so they are concave towards the back...as an ear would be. Match up the stitches, put your needle through both sides, YO and ch 1. Sc around the ear until you come all the way back around. FO. You will have two tails right by each other. Position the ears on the hat and use these tails to secure very well. These steps are pictured below. Two pieces laid on top of each other with the smaller inside the bigger. Tuck inthe tails in between the two sides. This is where you put the needle through both sides. Then you YO, ch 1 and sc around . As you can see it is important to have the sides lined up correctly so you can make the ear properly. If you enjoyed this pattern please "like" me on Facebook or follow me on Twitter to get updated on my newest patterns and tutorials! This is exactly what I was looking for! It is absolutely adorable♥ I am looking forward to more of your work...thank you! this is sooo cool. thanks for posting this pattern. i'm gonna make one for myself to wear for the easter egg hunt i'm organising at my work. Thanks so much guys! I was thinking about making one for myself too! OMGosh...this is adorable. Thank you for sharing. I'm glad to find your blog. LOVE, LOVE, LOVE this! I'm linking to it on Facebook. Thanks for sharing this season approriate gem! Thanks for the pattern. This is adorable! This is adorable! just what I have been looking for! I love it! And staying home with the kids will be one of the best decisions you ever made. After teaching for 25 years, my husband and I adopted a beautiful baby boy. I tried the "working mom" thing, and it just didn't work for us: my kid had colds and ear infections every 2 weeks from being in day care (and it was a very good day care, too! ), my boss (who has no kids) got angry every time I had to stay home with my kid, and I was miserable and missing the little guy all the time. Now I do day care out of the house and we eat a lot of mac and cheese, but we are all much happier. That is AWESOME! I love hearing stories like that. I am so excited that I am going to be home with my little ones! What a cute idea. I added a link to this in my Easter resources blog page. Best wishes on your blog. I started to make this hat but it looked like a beehive - not big enough for the 8 week old I'm making for - so now I am resorting to starting over. Any suggestions? Using caron yarn and H8 hook - did all 17 rows of hat??? Hmmm...I used Mary Maxim yarn which is comparable to any cheap yarn. Are you using the realy soft Caron yarn? I find the soft stuf to be thinner which could be part of the reason. I have a loose stitch so your stitch may be more tight then mine. And yes I used a size H hook. Are you doing a half double crochet stitch or a single stitch? I would try putting 9 stitched in row 1 instead of 7. This will make the initial top of the hat larger and less pointed. You can always continue out with the rows if you feel it is still not long/big enough. Example: Change row 8 to Ch 2, hdc in sm sp, (1 hdc in next 7 ch sp, 2 hdc in next sp) repeat from ( to ) around, join to top of ch 2. Then make rows 9-18 the same as 8-17 are now. Hope this helps! Yes my yarn is soft and I crochet a bit tighter - I will give your suggestion a try - also do I have to use the magic circle or can I just start with a certain number of chains and then slip stitch? i used the vanna white baby yarn and made it in no time! adorable! Does sm sp mean same space? Yes it does, and I keep meaning to change it. this one is cuter, can't wait to see how it comes out. Thanks for the pattern and your quick reply. What is the total stitch count for the final row? So sorry but it has been a couple of years since I made that hat and I didn't keep track. As long as you end with a ch 2 in same space, 6 sc in each of the next six spaces in round 7 you should be perfect. Even if you are off a couple of stitched somehow it won't make that much of a difference. This is such an adorable hat, but I am feeling so discouraged right now... I just got to Row 17 and the hat just does not look right... 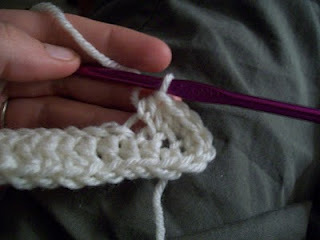 I think I might have a tight crochet stitch as well and have a little beehive issue going on. Also, the side of the hat that you "join" to the other side seems longer than the rest of the hat and also the joinings (because I don't know what else to call it, appears like a noticeable waving line. I don't know what I did wrong. I am somewhat new to crocheting and this is my first hat, so maybe it's to be expected. Also, is the bottom of the hat in the picture rolled up? Mine seems to naturally want to roll up, expect for the longer side, and either way looks way smaller than the hat in the above picture. No way it's gonna fit on my sons head. :( Am I doomed to just pull it all out and start over? I don't think I'm joining right. Can anyone help me out, please? Thank you for the reply! 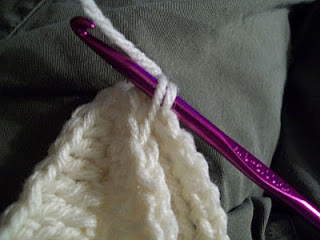 Yes, I am using a H hook with Lily Sugar and Cream yarn. I am making it for my son, so I'm not in a huge rush, I just want to make sure I'm following the pattern correctly. I think I will start over and use this as a learning experience. I wonder if I'm interpreting the "hdc in same space" correctly as well. 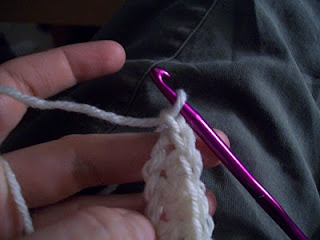 To join, I was just going into the next stitch and pulling my working string through both loops, then chaining 2. It was semi-noticeable, but then at Row 8 it started veering way off to the right. lol I don't know why I had so many problems. Great hat, just what I needed. I'm using Caron Simply Soft in the light purple for a birthday present for a one year old that loves bunnies. Thanks, this is just what I needed. Great pattern and tutorial. You can search ravelry for a 3 mos old beanie and just attach the ears. They might be a bit large so you could go down a hook size or two (for the ears). This hat was so cute in the picture that I printed and saved the pattern until now when my daughter is having her first child. I think there is something inherently wrong in the pattern instructions, as I too have a "beehive". There are just not enough total stitches to be accurate. Looking at your picture, there appear to be at least twice as many stitches. So many people like this pattern that it would be a shame if you did not reexamine it and include a total stitch count at the end of each row so we can ensure that we are on the right track. I ended up with only 26 stitches...perfect for a preemie. If you could offer any help I would appreciate it ASAP at: themammabear@hotmail.com Anyone else who could help is also welcome to email me. Blessings! Sorry you are having problems but I don't have time to fix this pattern at this time. Perhaps try another pattern for the size hat you need and use the ears (which no ones seems to have a problem with). There are some suggestions on good hats on Ravelry. Good luck! I have to agree with you..... there are some amazing beanie patterns on ravelry.com. If people would read at the beginning of this post they would realize you know that there is a problem and you have supplied a solution.... I thank you for that... I am going to use the ears and I will take your advice and find a beanie pattern on ravelry.... thank you for your time and effort to supply us with such cuteness. I'm glad I read the comments before I started. I don't usually do that - but I will now. Thanks for acknowledging that there may be an issue with tight stitches or perhaps something else. I am definitely going to use the cute ears! Thanks for the time you've put into this project. I'll be back! 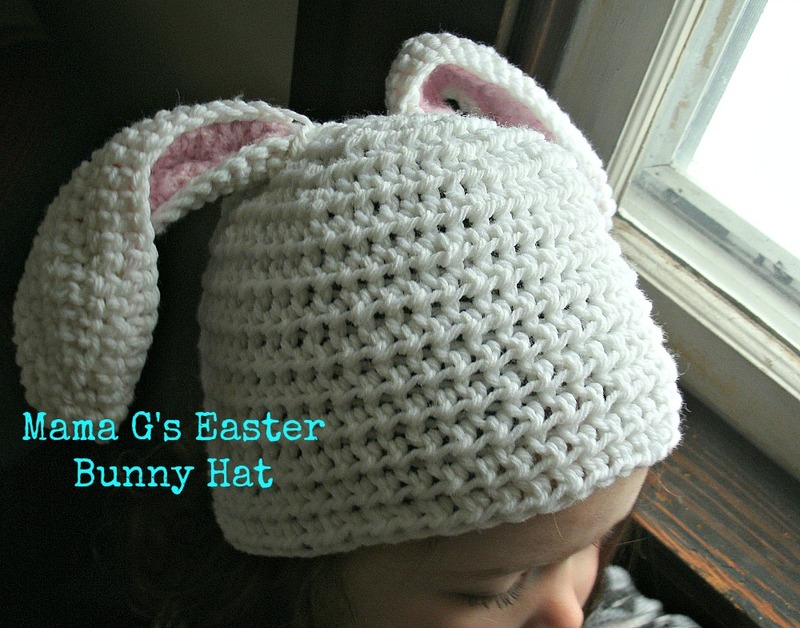 I am linking this post in my own blog as I'm sharing about my floppy bunny ear hat project and used your ear pattern :) You can find it at ivingwellwithsuziq.blogspot.com Thank you for sharing!